Earthy colored bird bath with inscription and delicately painted flowers. 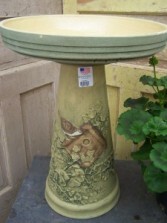 Made in the U.S.A.
Earthy colored bird bath beautifully decorated with an ivy, birdhouse and wrens. 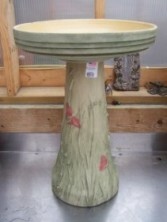 Made in the U.S.A.
Earthy colored bird bath decorated with grass and butterflies. Perfect for every garden. 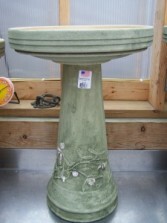 Made in the U.S.A.
Bird bath in a fresh green color, with pond plants and frogs engraved in the bottom of the bowl. 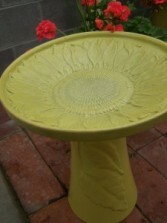 Made in the U.S.A.
Bird bath made in a bright green with a sunflower engraved into the top and stem and leaves on the base. 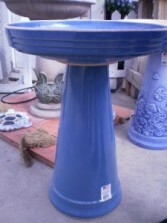 Made in the U.S.A.
Clay birdbath done in a light blue. 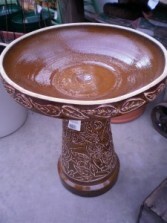 Clay birdbath done in a gorgeous brown/ gold color. Earthy yet elegant with intricate peony outlines on base and top. 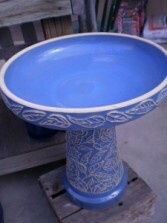 Clay birdbath done in a sky blue with an intricate peony design. 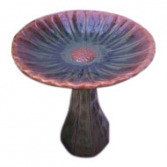 This unique looking birdbath will be the biggest flower in your garden. In a green/ golden brown color it is a perfect addition to your yard. Flowers convey a message that cannot be put into words. WHITE LAKE GREENHOUSES FLORAL of Whitehall, MI provides a variety of fresh, fashionable floral designs to ensure that your gift is one of elegance and beauty. 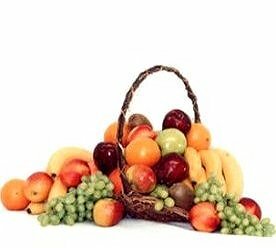 When you're looking for a unique hostess gift, token of appreciation or just a surprise to brighten someone's day, let WHITE LAKE GREENHOUSES FLORAL customize and deliver one of our many fun, decorative & luxury gifts! We create dazzling presentations that are sure to please for any gift-giving occasion. 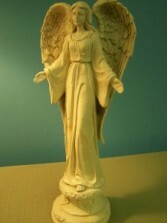 To get your custom gift items, come by and see WHITE LAKE GREENHOUSES FLORAL - your local Whitehall, MI florist.